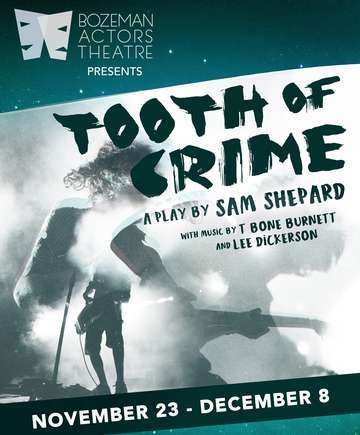 > Events in Montana > "Tooth of Crime" by Sam Shepard. Presented by Bozeman Actors Theatre. Following its acclaimed production of Sam Shepard's Fool for Love at the Eagles last season, Bozeman Actors Theatre presents Shepard's thrilling rock-and-roll epic of power and fame, Tooth of Crime. In a celebrity-obsessed America, an aging rock warlord and his ragtag entourage struggle to stay on top with challengers at every turn. When an upstart rival who breaks all the rules comes on the scene, only one can emerge the victor in a duel to the death—a duel where words and music have become the weapons of choice. Gordon Carpenter directs a talented musical cast and live rock band in a poetic tour de force! The play’s score by T Bone Burnett and Lee Dickerson will be performed live by The Keepers, and the cast of BAT veterans features Mark Kuntz (The Realistic Joneses), Tonya Andrews (Copenhagen), Will Dickerson (Fool for Love), Sydney Madill (Life of Galileo), and Torie Laher (Fool for Love). All ages are welcome, but parental guidance is suggested (profanity, drug use, and stage violence). 100% of your ticket price supports the production on stage, including stipends for our local artists. BAT is a 501(c)(3) nonprofit organization.